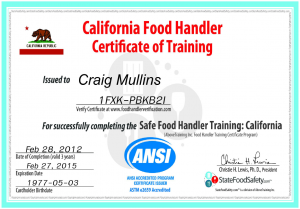 Top takeaways from the California Food Handlers Card Test. Salmonella is the most common bacterial illness in the United States. Commonly found in meat; especially poultry. 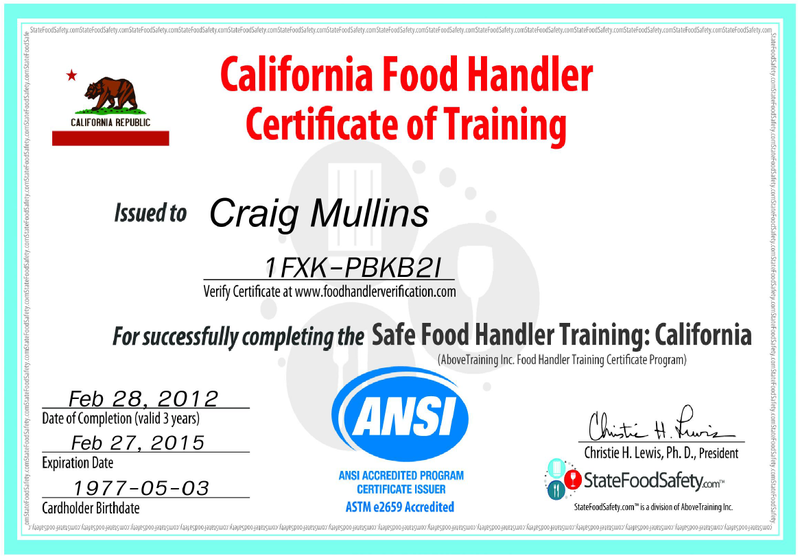 If a food worker gets a cut on the hand or wrist the worker must wear an impermeable cover over that body part that will not allow any blood or pus to come thru. In addition to that they must wear a single use plastic/latex glove. A wound on arms must be covered with an impermeable cover. A wound on other parts of the body require a dry, durable, tight fitting bandage. If you cut or burn yourself while on job stop what you are doing and treat and bandage injury. Throw away the food you were preparing even if you are positive the food was not exposed to blood. If you feel ill while working, you MUST tell your manager. You should not work if you have the flu, a cold or any respiratory infection. Do not enter your workplace if you have diarrhea, vomiting, fever with sore throat or jaundice. This could be an indication you have one of the “Top 5” pathogens above. If your dr. says you have one of the big 5, you must tell your manager as he may have to report it to the local health department. Scrub vigorously at least 20 seconds paying attention to the area under fingernails. Some people say the alphabet to know when they are done. Rinse off, under hot running water. Repeat these steps if necessary. You should do a “double hand wash” fully completing steps 1 – 5 two times if you are working with raw meats, you use the restroom or change a diaper. Change every 4 hours – bacteria starts to rapidly multiply after this amount of time. Do not ever touch food with bare hands. Use gloves, deli tissue, tongs or some other utensil. Never let your fingers touch the top of a plate, use your palm to hold the plate. Carry knives, forks, spoons by the handle. Carry cups by the base of the glass or by the handle, never by the top where someone mouth will touch. Cleaning and sanitizing are not the same thing. Here’s the 6 step process. Make sure to thoroughly clean the sink first. This 3 basin sink should only be used for dishwashing. Don’t do things like pour old mop water down the drain in this sink to avoid contaminating the sink. Clean with a soap/detergent at least 110 degrees F.
Apply a sanitizer. Immerse item for required contact time. Allow to air dry. Do not use towels to dry. Common sanitizers include – Iodine, Chlorine & Quaternary Ammonium. Pay particular attention to recommend concentrations, water temperature recommended and contact time with sanitizer. Make sure to regularly test sanitizer concentration with test strips. If it’s OK to use hot water to sanitize in your area, the water must be at least 180 degrees F and the item must be submerged at least 30 seconds. Clean & sanitize any tools you’ve been using more then 4 hours. Boiling-Point Method – Put thermometer in boiling water. Water boils at 212 degrees F at sea level. Different elevations require different calibrations. The Temperature Danger Zone is between 41 degrees F. 135 degrees F. After 2 hours of cooked food sitting out at this temperature you have risky levels of bacteria. After 4 hours at this temperature the food must be discarded. Thawing – Don’t thaw foods at room temperature (eg. Sitting out on your counter). Proper methods include putting in the refrigerator, submerging food item under cool (70 degrees F or lower) running water. Do not use hot water. You can thaw food in a microwave if it will be immediately cooked or thaw foods as part of the cooking process. Once foods are cooked they must be held at a certain temperature. Hot foods must be kept at or above 135 degrees F. Check food temperatures every 2 hours and in several places in the dish. Stir the foods after taking the temperature to keep the temperate well equalized. Don’t mix the old held foods with new food when replenishing. Cold food must be 41 degrees F or below. Check food temperatures every 2 hours and in several places in the dish. Stir the foods after taking the temperature to keep the temperate well equalized. Don’t mix the old held foods with new food when replenishing. Ice used for cold holding should not be used for any other purpose (eg. Drinks). Avoid holding food directly on ice; instead put food in a water resistant dish on top of the ice. Cooling hot food for storage. 2 stage cooling – First stage hot food should be cooled from 135 degrees F. to 70 degrees F. in less then 2 hours. In the second stage food should be cooled form 70 degrees F. to 41 degrees F. or lower in 4 hours or less. Total cooling time must be less the 6 hours. Cool in an ice water bath. Put pan in ice water. Stir food frequently to allow heat to escape. Label and date all stored food. Leftover should not be kept longer then 7 days. Keep food at least 6 inches off the floor. Reheating food. – Food must be brought up to 165 degrees F. within 2 hours. If it can’t be brought up to that temperature in that time period it must be throw away. Receiving food shipments – Check the temperature of food when they are delivered to make sure they are at the proper temperature. This entry was posted on Tuesday, February 28th, 2012 at 12:45 PM	and is filed under Misc.. Both comments and pings are currently closed.